Read the following selection from Ten American Girls From History by Kate Dickinson Sweetser to answer questions 20-23. 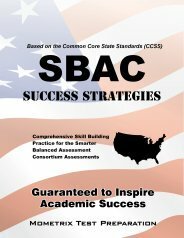 Prepare with our SBAC Study Guide and Practice Questions. Print or eBook. Guaranteed to raise your score. Get started today! Clara Barton!—Only the men who lay wounded or dying on the battle-field knew the thrill and the comfort that the name carried. Again and again her life was in danger—once at Antietam, when stooping to give a drink of water to an injured boy, a bullet whizzed between them. It ended the life of the poor lad, but only tore a hole in Clara Barton’s sleeve. And so, again and again, it seemed as if a special Providence protected her from death or injury. At Fredericksburg, when the dead, starving and wounded lay frozen on the ground, and there was no effective organization for proper relief, with swift, silent efficiency Clara Barton moved among them, having the snow cleared away and under the banks finding famished, frozen figures which were once men. She rushed to have an old chimney torn down and built fire-blocks, over which she soon had kettles full of coffee and gruel steaming. “The faces of the rough men working at my side, which eight weeks before had flushed with indignation at the thought of being controlled by a woman, grew ashy white as they guessed the nature of the summons, … and they begged me to send them, but save myself. I could only allow them to go with me if they chose, and in twenty minutes we were rocking across the swaying bridge, the water hissing with shot on either side. “Over into that city of death, its roofs riddled by shell, its every church a crowded hospital, every street a battle-line, every hill a rampart, every rock a fortress, and every stone wall a blazing line of forts. SBAC Flashcards. 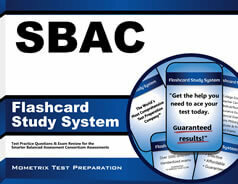 Proven SBAC test flashcards raise your score on the SBAC test. Guaranteed. “Oh, what a day’s work was that! How those long lines of blue, rank on rank, charged over the open acres, up to the very mouths of those blazing guns, and how like grain before the sickle they fell and melted away. 20. What can be inferred from the fact that the men’s faces turned “white” in the underlined sentence? The men were afraid that Clara would be seriously hurt or killed by going to help. The men had not wanted Clara to tend to them or order them around when she first arrived. The men were terrified of the coming war and wanted Clara to escape with them. The men did not want to be moved to the hospital on the other side of the bridge. 21. Which of the following might be a good title for the above selection? 22. Why does the author mention the instances when Clara’s life had been in danger on the battlefield? To show that Clara was an unwilling participant in the initial war effort. To help the reader picture how Clara seemed to not really be a part of the battle. To compare how many battles she lived through with how many armed men had not. To illustrate how battles were turned through the care she provided. 23. Which of the following best explains why the author referred to one of the soldiers as “the poor lad”? She wanted to show that the man had little or no material belongings. She wanted to build sympathy for the young man who died. She wanted to show that the soldier had only been a young boy, not a man. She wanted to create an image in the mind of the reader about the soldier. 1. A: The text indicates that the “rebel fire was hottest, the shells rolling down every street, and the bridge under the heavy cannonade” and “a courier… placed in my hand a crumpled, bloody piece of paper, a request from the lion-hearted old surgeon on the opposite shore, establishing his hospitals in the very jaws of death.” Both of these indicate that the soldiers knew that the situation was dangerous, no place for an unarmed lady. 2. A: The text mentions Clara being helpful during several battles. While she may have helped throughout the Civil War, it is not the topic here. Choice C focuses more on other nurses in the war, and Choice D doesn’t make sense because Clara was on the battlefield when the fighting was taking place. 3. C: The author mentions that men had been shot while Clara lived, demonstrating an interesting dichotomy of her life: the unarmed nurse who was protected on the battlefield, while the armed men did not seem to be. 4. B: While the other choices may have some truth to them, there is no evidence in the text that the soldier had little money (A). Options C and D give only partial answers.